GrabCAD Print Advanced FDM provides a powerful yet intuitive toolset to obtain desired part characteristics by automatically controlling FDM build attributes. 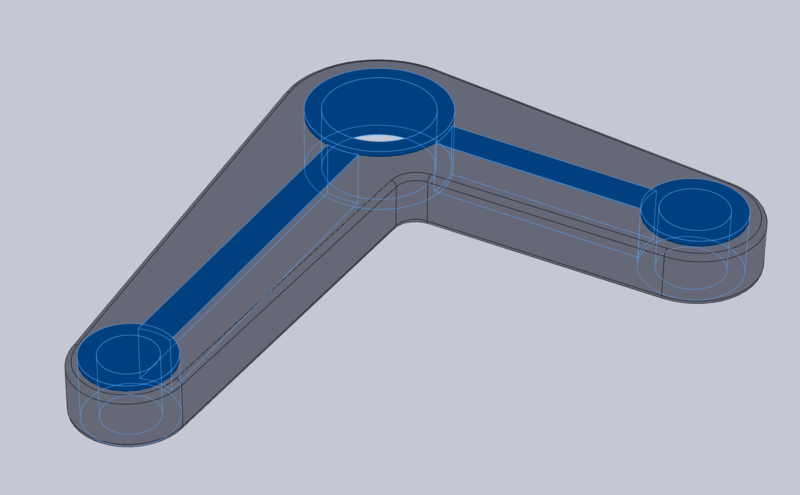 By assigning attributes directly to your CAD models, you can specify areas of strength and rigidity, control infills, ensure sufficient material around holes with inserts, and avoid seams. All necessary tool paths are then automatically calculated without requiring manual manipulation of individual layers- ultimately reducing the time it takes to prepare a job while improving overall part quality. With this different approach to toolpath generation to GCP it is very important that combinations of material and printer are thoroughly tested for printed part quality. At this time not every combination has been tested, over time additional printers and materials will be added. F900, F370, and all Fortus systems excluding the 250mc and 360mc are supported by Advanced FDM. ABS-M30, ASA, Nylon 12, Nylon CF, PC, Ultem 9085, Ultem 9085 CG, Ultem 9085 Black. Since Advanced FDM uses precise geometry selections to make adjustments to your print settings, mesh formats such as STL, VRML, and OBJ are not supported. Only native CAD files and interchange formats with precise geometry are supported. Read the full list of formats here. 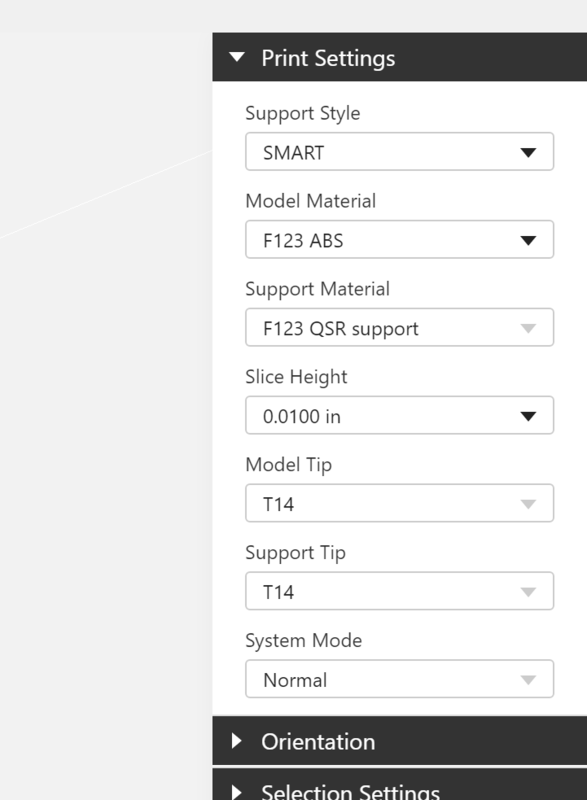 If you have used Stratasys Insight before, you may have fine-tuned your print settings using Custom Groups and applied them to contours within each slice. In Advanced FDM, by contrast, you apply your settings to the geometrical features (bodies and faces) of your CAD file. Therefore, if you want a certain region within your part to be printed with different settings, that region must be defined in CAD. Often it will already be a selectable face, but purely internal regions may require extra steps to define separate bodies. This file, for example, was designed to be printed as one piece with mostly sparse infill, but some regions in solid. The part was cut into multiple bodies and then saved as a multi-body part. Once you confirm that your printer and materials meet the requirements, you can enable Advanced FDM in with File > Preferences > FDM. This will add the Advanced FDM view button in the main navigation bar on the right side. Add your CAD models to your Advanced FDM project. Select which parts you will be editing and activate them. Select baseline print settings like slice height and material. Make adjustments to the body as a whole or to individual sections. Examine the generated toolpaths in slice preview. 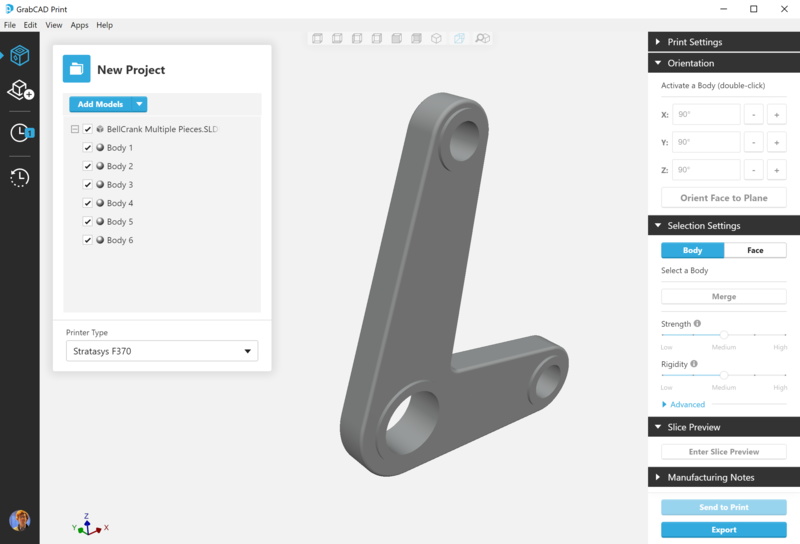 Save or export your part, or send directly to GrabCAD Print. Continue reading below for advanced descriptions for each of these steps. When you use Advanced FDM you create a new project file. GrabCAD Print and Advanced FDM use different formats of project file, and cannot be open simultaneously. Therefore, any changes made in GrabCAD Print must be saved before using Advanced FDM, and vice versa. Use the Add Models button or File > Add Models to bring CAD files into your Advanced FDM project. You can add many models to a project, but you can only make edits to one object at a time. To begin making edits to a part, body, or group, double-click to activate it. You can also activate items from the right-click menu in either the project panel or the 3D viewer. If your model is comprised of a single body, it will be activated automatically. If your model is an assembly or has multiple bodies, you can choose to print them as separate parts or as a single assembled part. This is achieved by creating merged groups. 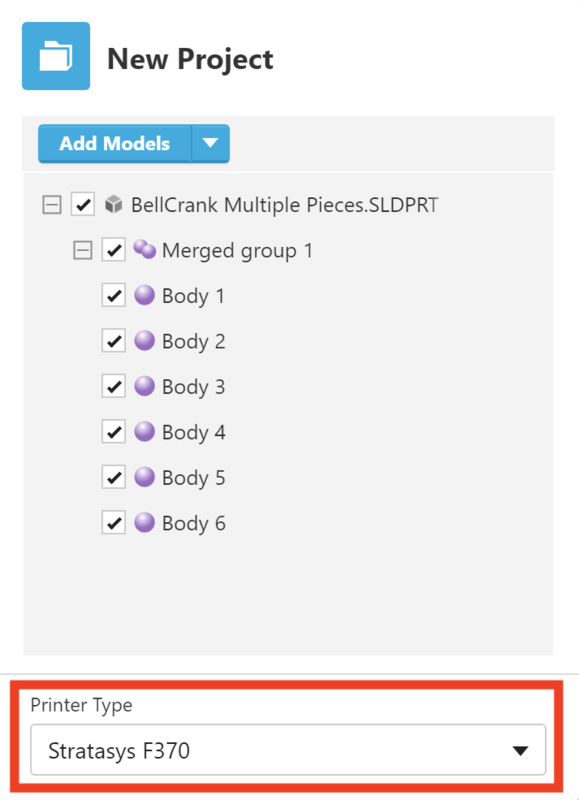 Select the top-level assembly for the part you want to print as assembled and right-click and choose "Merge" to create a merged group. The merged group can now be activated from the project panel. 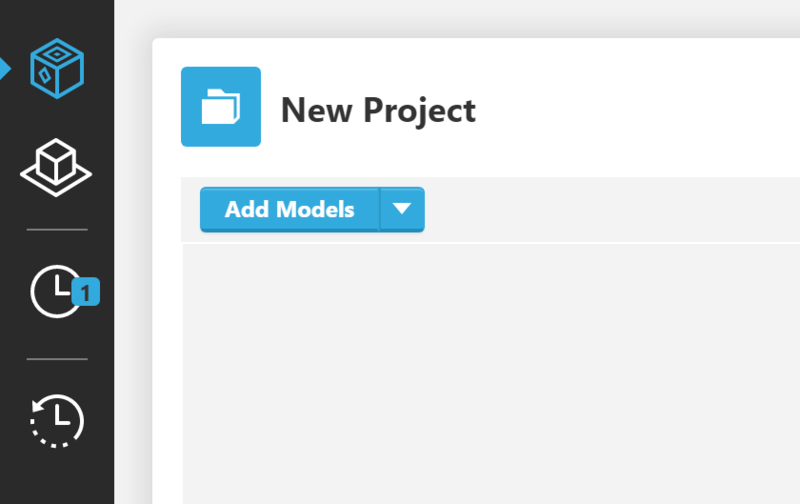 If your model has parts or bodies which are not designed to be printed, you can hide them using the right-click menu. Select your printer from the dropdown at the bottom of the Project Panel. Choose printer settings from the first set of tools on the right side. The printer applies to the whole Advanced FDM project, but you can change it at any time and your edits will be maintained. Overall printer settings must be set manually, they are not set automatically like in GrabCAD Print. This is because Advanced FDM does not make a connection to your real printer. Your print settings can be changed for each activated object except those within merged groups. The orient tool is similar to the one available in GrabCAD Print. You can set the orientation for any activated object except those within merged groups. There are two types of selections: body and face. Select a body by clicking it in either the 3D viewer or the project panel. You can also use shift+click in the project panel to select a group of bodies, or click and drag to box-select in the 3D viewer. 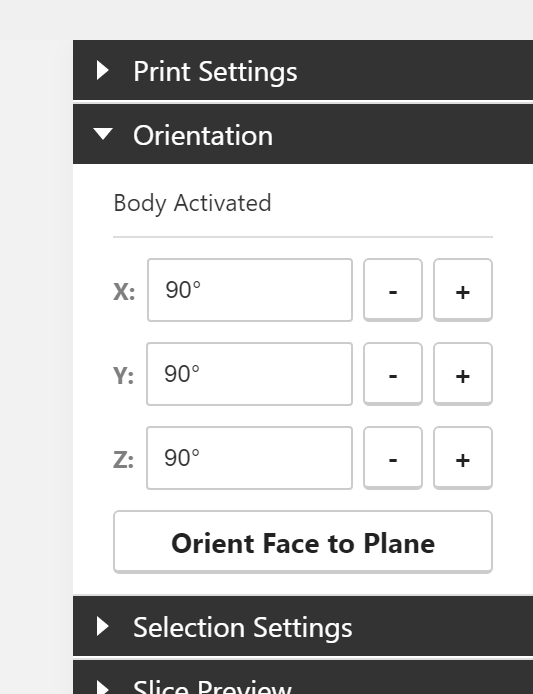 To select a face, click the "Face" button under Selection Settings. Shift+click to select multiple faces. These are the types of adjustments you are used to making for your 3D printed parts, with a few more options than what is available in GrabCAD Print. Strength — Adjusts the density of the infill pattern, from the least possible all the way up to Solid infill. Rigidity — Adjusts the number of contours around vertical surfaces and solid layers around horizontal surfaces. Advanced options — These settings override the Strength control. Infill pattern — Allows you to choose the specific style of infill. Tooltips describe the different patterns available. Infill density — Control the density of the infill pattern by percentage points. Infill angle — Rotate the infill pattern to better suit your part's geometry. These are a new set of adjustments that are unique to Advanced FDM. 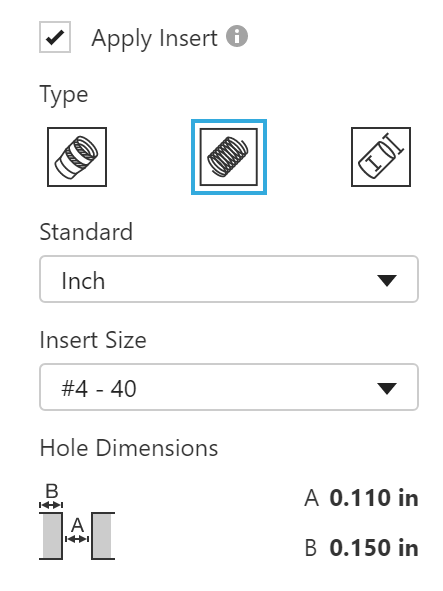 Apply Insert — Because it isn't advisable to 3D print a thread, you can use Advanced FDM to select any hole (cylindrical face) in your geometry and make sure it has the proper dimensions to apply threads via a metal insert. 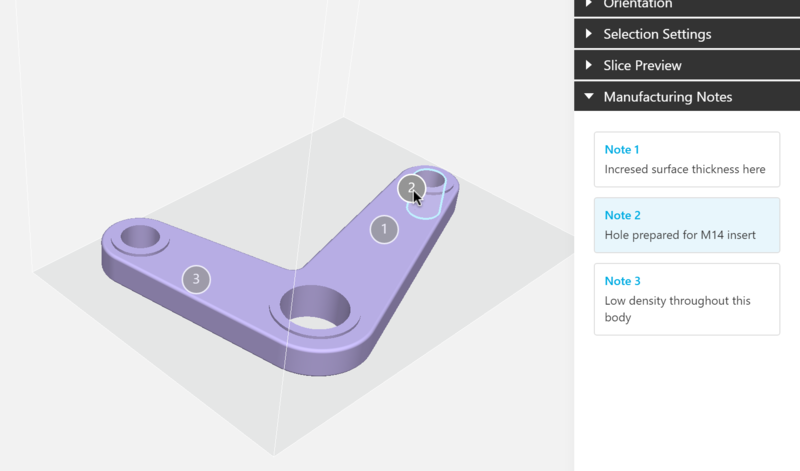 Make Self-Supporting — If you have holes in your geometry that will print horizontally, this feature will change them to a diamond shape so that they don't require support material. Avoid Seams — Each toolpath's end point leaves a small irregularity in the surface, usually on an edge. 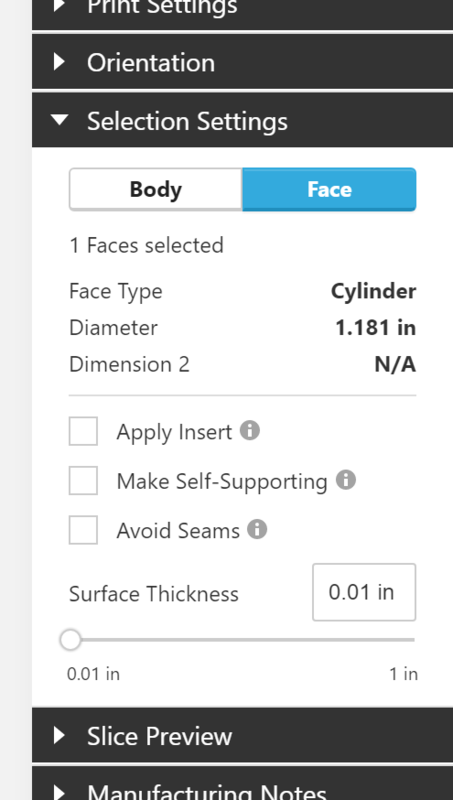 If a particular surface's shape is crucial, you can select it and apply this feature to prevent the toolpath from ending on it or any of the surrounding edges. Surface Thickness — Similar to the Rigidity control for bodies, but applied to a particular face. Enter and exit Slice Preview from the tool on the right side. Here you can adjust your view range to investigate specific sections of the toolpaths throughout your model. You will also find your time and material estimates inside the Slice Preview tool. Printed parts often need finishing operations performed, such as painting, sanding, or adding inserts. Advanced FDM allows you to annotate the parts in your project with notes attached to bodies or faces. Screen shots can then be captured to send to the shop floor with the finished parts. 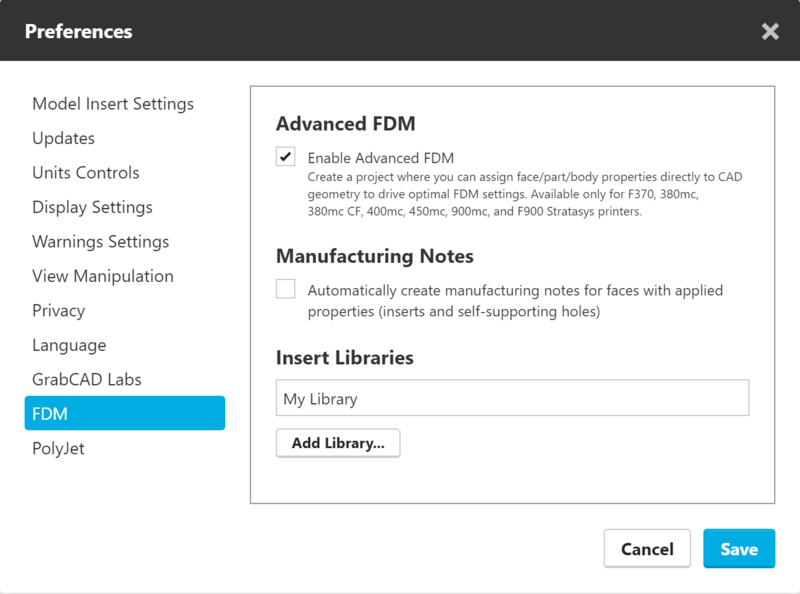 You can also automate the creation of notes for inserts by enabling the preference for Manufacturing Notes in File > Preferences > FDM. Notes are shown on screen by a balloon with a numeric ID, mouse over highlights the geometry associated with the note, selection of the ballon will open a pop up showing the note text and functions to edit or delete the note in addition selecting the note will also restore the exact graphical view of the model from when the note was created. Notes are also shown in the Manufacturing Notes tool on the right side. Note: In a future update of GrabCAD Print, you will be able to save a PDF document containing all the note text and screenshots to be used as a traveller document for the shop floor. Export the activated object as a CMB file, to be brought into Print or Control Center at a later time, or transferred directly to the printer via USB. Hit "Send to Print" which will prompt you to save and close the Advanced FDM project, and add the activated object as a CMB file in a new Print project. You can also bulk export CMB files of all printable objects if you hit Export while viewing the top level part. Note: Projects saved from Advanced FDM will use the file extension *.print-fdm to distinguish them from regular GrabCAD Print projects.